Welcome to Chez Madeline! Chez Madeline was originally built in the early 1900's as a loggers barracks. It was then purchased; and, became a summer home. The history of Chez Madeline has seen two families occupy the private grounds. Most recently the owners used the property as a family retreat. The home itself served a more important purpose; a place for the family, children and grandchildren to spend summers together! It is with this in mind that the family hopes to be able to share these exceptional experiences with other families. From the beautiful original cabin to the large private beach, there are few properties on the island that offer the such privacy while still being within five minutes of downtown La Pointe. Chez Madeline also features Wee Hoose, a quaint guest house with two rooms and a 3/4 Bath. It is located directly above the lake and gives one the feeling of sleeping on the beach when the windows are open, and views of Lake Superior. 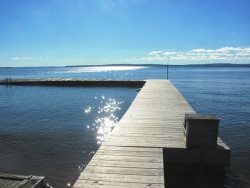 Working with Madeline Island Vacations is always a pleasure. The house and property are just part of the amazing time we had on the Island. If you didn't want to you wouldn't have to leave this property the entire vacation. Great beach, great deck, big dinning room for entertaining the family. Just a wonderful family house for a family vacation. Chez Madeline is a great place for families.